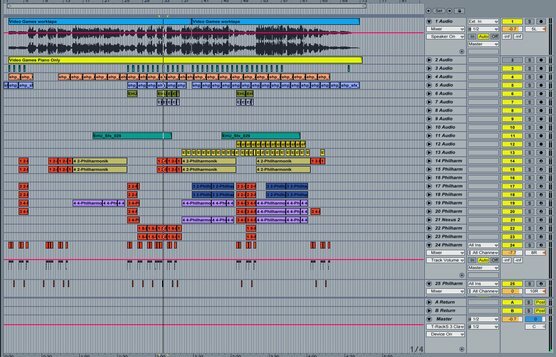 When producer Daniel Omelio (half of the production duo Robopop) mixed the raw piano and vocal recordings of Lana Del Rey's "Video Games" into a full song, he chose "his" DAW - Ableton Live. The final Arrangement for "Video Games" in Live. Omelio on working in Live: "I did it in [Live], because it’s the first program that I ever got into, and it is very user-friendly, and I know it like the back of my hand. It’s really quick, and for me it’s a comfort thing, as I’m used to making everything sound crispy and sonically pleasing in [Live]." Effects chain used by Omelio on "Video Games"
Learn more about Omelio's production of "Video Games" in Sound on Sound (English) and Sound & Recording (German).